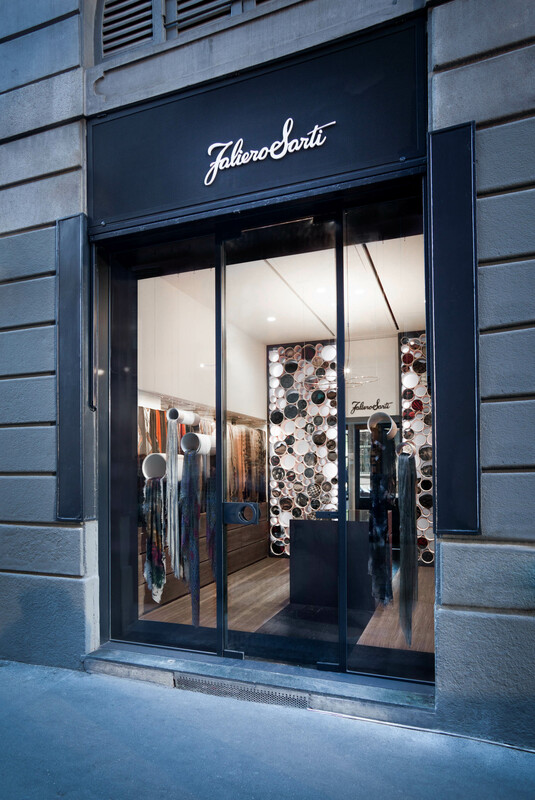 The design solution for a particularly small commercial space of about 200 sqFt downtown Milan. The concept works with dynamic geometries of suspended tubes dialoguing with the scarves over a numberless configuration range.Faliero Sarti has assigned AR.CH.IT Luca Cipelletti the new retail concept for their own scarves boutique, requesting from the studio to summarize and valorise the quality of their products in small commercial space, using innovative exhibition methods than can give a new imagine to the brand. 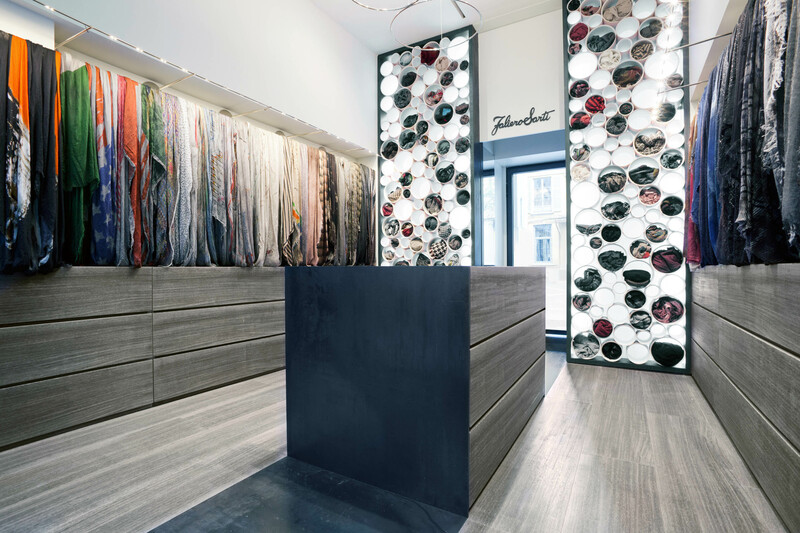 The development of the concept for the new flagship store in Milan, came simultaneously with its application in the design of an only 18mq store in Via Solferino, at the centre of Brera. The concept begins with the geometry of the single chosen exhibition element. The tube, an object from the wrapping form, without edges that blends with the softness of the product. 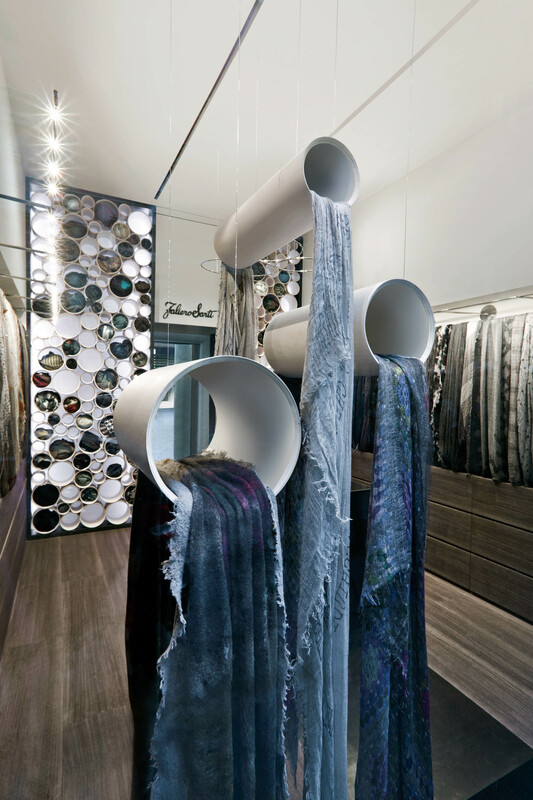 Pure suspended tubes are placed in the shop window, dialoguing with the scarves in an endless configuration range. At the background of the store they pile up in a graphic texture that can be endlessly multiplied. 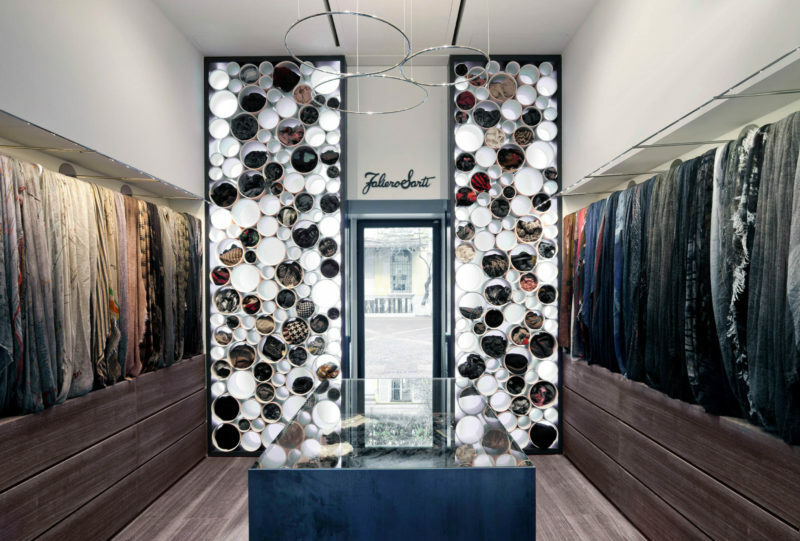 A wall of a great visual impact, with its own dynamic and possibility of change, not only with the products exposition but also with the backlighting that allows color variations that can point out the tonality of each single collection. The pre-existence of the backyards window door becomes the motive of the asymmetric misalignment of the store, creating a telescope that can be easily noticed also from the other side of the street. An axis marked on the pavement with natural black iron plates that become an exhibition volume in the central table. As natural, there is wood on the pavement and the side drawers, that serve as an ulterior exhibition but also as a deposit. 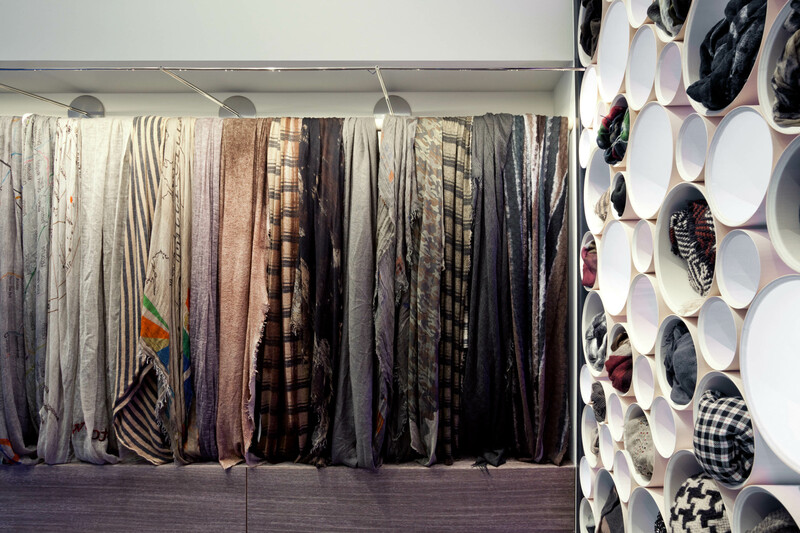 On the side walls scroll naturally the more decorative scarves, than are being emphasized due to a new very thin led bar of Catellan&Smith which has produced also the chandelier with the three circles designed specially for Faliero Sarti. 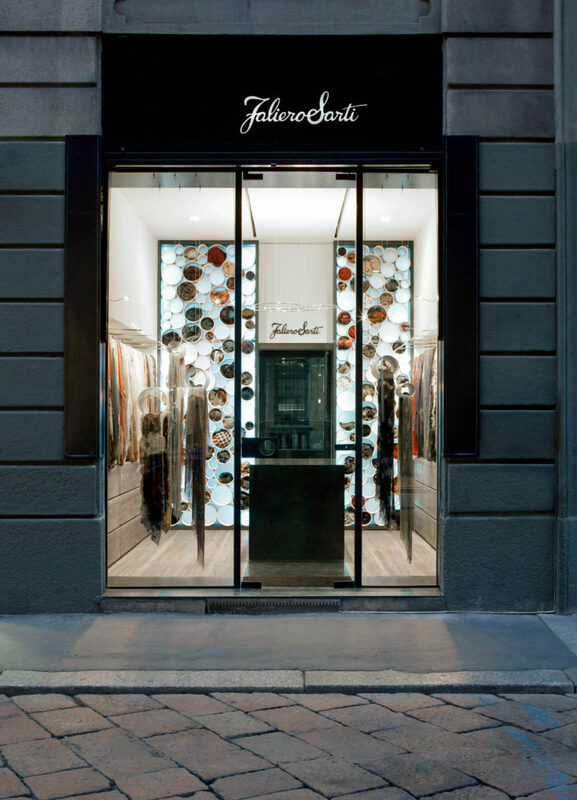 The concept was ceded to Faliero Sarti for the realization of new commercial space.